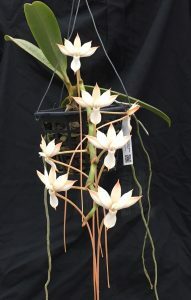 This is a robust Aerangis species from Central and Eastern Madagascar with thick waxy flowers and a long spur. We grow the species hanging in the roof of Warm Asia although it’s natural habitat in woodland from 1100-1400m suggests it could grow cooler. We spray the basket daily but this gives plenty of time for it to dry out between waterings. The flower spike on this species is very slow growing. 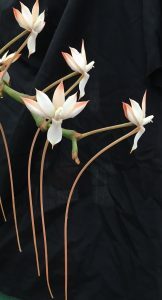 The spike emerged in the spring and we have been watching it eagerly as this is the plant’s first flowering. On several occasions we thought the spike was aborting as its growing tip was generally a pink/brown colour and this colour is also strongly present on the back of the flowers and the spur. This may be an evolved strategy to deter animals from eating the tender growing tips and flower buds.